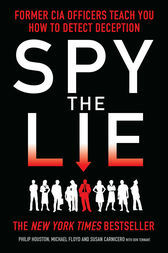 Spy the Lie is a fascinating study of deception and a comprehensive lesson in how to identify and combat it. Featuring case studies based on the authors’ real-life experiences in the field – involving ‘turned’ assets, KGB moles and criminal government officials – it reveals the methodology developed and used by the CIA to detect deception in the realms of counterterrorism and criminal investigation, and shows you how you can apply these techniques in your daily life. Whether hiring a new employee, investing money, knowing whether your boss is being straight with you, or finding out what your kids have been up to, this ingenious book will enable you to identify deceptive behavior in all its forms, and show you the techniques that will help you reach the truth. Philip Houston spent 25 years in the CIA, including roles as an investigator and a polygraph examiner. He is credited with developing a detection of deception methodology currently employed throughout the U.S. intelligence and federal law enforcement communities. Together with Mike Floyd and Susan Carnicero – like Phil, former CIA agents and leading authorities on interviewing, detection of deception, and elicitation – he founded Qverity, a provider of behavioral analysis and screening services for private- and public sector clients worldwide. Don Tennant is a former National Security Agency analyst, and is now a business/ technology journalist. He has been the recipient of a number of prestigious journalistic awards, including the Jesse H. Neal National Business Journalism Award.